On the banks of the Barcoo River away from the highway noise, Stubby Bend offers fully self-contained travellers a free site for camping. 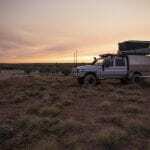 A variety of birds visit the area throughout the day, you can watch the kangaroos grazing in the afternoons, and quite often at night friendly possums will visit your camp site. When the waterhole is high you can catch a yellowbelly for dinner. 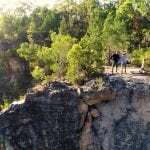 From Stubby Bend you can explore the Coolibah Walk and discover the natural flora along the river bank as well as visit the historic Qantas crash site. Please remember no amenities are available and campers must be self-contained. This is a natural environment that requires care and protection. Please use the bins and leave the area clean, do not throw rubbish into the river. The area is subject to flooding in the wet so it is best to park on the gravel area. Picnic tables and seats are available to use; enjoy an evening stubby or two while you catch up with your fellow travellers.